Are You Using Last Click Attribution In AdWords? Stop Now! You must have heard it a thousand times: today’s customer journey is more complex than ever. When searching online, people use multiple touchpoints and devices before making a decision. Think about it, have you ever booked a holiday in one setting and on one device? Highly unlikely. As a marketer, you need to be able to prove that your efforts are paying off to justify the money your company is investing in various channels. AdWords is good at this because it tells you exactly how many conversions you received from a specific campaign, ad group or keyword and how much this conversion was worth to you (if you’ve set up your conversions properly). This all sounds great but how does AdWords decide which campaign, ad group or keyword to attribute your conversions to? In this treacherous journey, which online search or browsing activity is to be credited for a conversion? AdWords uses the attribution model that is set up when you create your conversion. According to Google, an attribution model is a “rule, or set of rules, that determines how credit is assigned to touchpoints along the conversion path”. 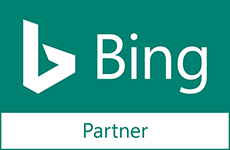 So, AdWords connects the dots between your customers’ different touchpoints and then chooses to attribute the conversion following the model you chose. This, is the basis on which you will be analysing your campaigns performance and deciding where to spend your money. So, it’s quite important to get it right, don’t you think? First Click Attribution: a conversion will be credited to the first click in the customer journey and all other steps will be ignored. Last Click Attribution: a conversion will be credited to the last click in the customer journey and all other steps will be ignored. Linear Attribution: a conversion will be credited to each step in the customer journey. One conversion will be equally divided between the different steps, so you might see a campaign with 0.2 conversion for example. Time Decay Attribution: a conversion will be credited to each step of the customer journey, but its weight will increase as you get closer to the conversion action. Position Based Attribution: a conversion will be credited to each step of the customer journey, but the first and last clicks will have more weight than the other interactions. Data Driven Attribution: a conversion will be credited to each step of the customer journey, but its weight will change according to its statistical relevance. To do so, Google will A/B test your campaigns against each other and determine their conversion rates. If one campaign has a higher conversion rate due to an extra touchpoint, it will attribute a higher percentage of the conversion to that step because it has more weight in the decision process. For example, if you wanted to know if Messi brings more value to his team than other players, you could analyse all the games when he scored a goal and compare them to all the games when he wasn’t playing. If there were more goals in the games he played, you could conclude that he brings more value to the team. To know exactly how much, you’d analyse the ‘conversion rate’ difference between two games and attribute the difference to him. Now that you know what an attribution model is, and which models are available in AdWords, why should you stop using last/first click models? Well, you’re basically optimising your campaigns based on a fraction of the information. On average, customers use 5 touchpoints before making a purchase. Using first or last click attribution, you’re basing your analysis on one touchpoint only. It’s as if you were buying a house having seen one room out of five, you are missing key information. For example, someone might have bought a Nexus phone on your website. To make their purchase, they first searched for ‘great tech gifts’, then ‘highly rated tablets’ and finally for ‘nexus 9 tablet’. 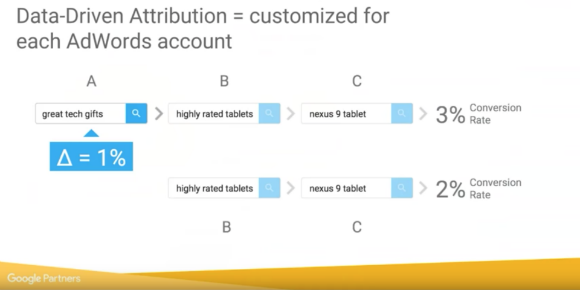 If you had a campaign for each of these terms and used last click attribution, the conversion would only be attributed to ‘nexus 9 tablet’. When analysing performance, you’d see all conversions coming from your Nexus campaign and none for the other two. You might be tempted to pause them because they’re clearly not profitable. However, you might lose conversions for the Nexus campaign after a while because you wouldn’t be showing for the first two searches. The customer would have researched their purchase with a competitor and probably bought from them when they were ready to buy. Which attribution Model Should You Use? Now you know that first/last click attribution is not representative of reality, which model should you use? Google recommend the data-driven model because, being based on statistics, it’s the most accurate. However, not everyone can use it because to be accurate, it needs data. This means that you’d need at least 600 conversions or 15,000 clicks over a period of 30 days. Unfortunately, it’s not always achievable depending on your business. 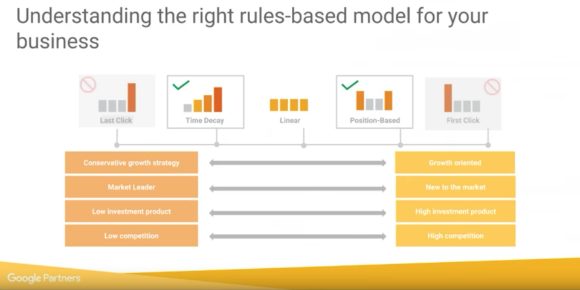 If you can’t choose the data-driven model, the next best thing is the time decay or position-based models. You don’t want to go for the linear model because it’s a bit too simple. Indeed, not all interactions have the same value during the customer journey. Right, so how do you choose between these last two? Google have put together a simple graph to show which is best depending on your business goals and position in your industry. You should choose position-based attribution if you’re growth oriented and your goal is to acquire new customers. Indeed, the most important steps for you are both the first and last interactions because they’re usually the most difficult to get right. Moreover, if your business is new to the market, if you’re selling a product that requires high investment and if your industry is highly competitive, position-based is the right model for you. You should choose time decay if you have a conservative growth strategy as your customers already know you. If you’re a market leader with a product requiring low investment in a low competition industry, this model is right for you. Due to your position, it’s less difficult for you to recruit new customers so you want to focus on converting them. That’s why the touch points closer to the conversion action have more value than the first. Now that you’ve chosen your attribution model, how do you change it? Log in to AdWords and go to your ‘Conversions’ page. Click to edit your conversion action and change the attribution model at the bottom. Do this for all the conversion actions that you’re tracking. Be careful when analysing the data in the few days after the change. Google will be reattributing your conversions to earlier interactions, so you might see a drop in conversions on the day. However, this doesn’t mean you’ve lost conversions, they’ve simply moved a bit further up the timeline. Be sure to leave one feedback loop before analysing the data. This loop corresponds to your conversion window from first impression or click until the final conversion. You can check this by looking at the time lag report. Going forward, keep that loop in mind when reporting on the data and avoid including the past 5 days in your analysis. This is because you need to allow sufficient time for conversions to register. Once you’ve changed your model, don’t just continue as usual. Use the insights to rethink your AdWords strategy. If you paused generic campaigns in the past because they weren’t performing, re-enable them and see how they perform now. Are they getting any conversions under the new model? If you have negative bid adjustments on mobile, check them again. Is your mobile conversion rate higher now? Most online searches start on mobile so make sure you’re capturing these top-of-the-funnel searches to be there at every touchpoint of their journey. Now Change Your Attribution Model! Now that you know everything about attribution models in AdWords, go change your model and invest your money where it converts. If you’re not sure how to optimise your campaigns or if you have more questions about your AdWords account performance, contact us and we’ll be delighted to help!